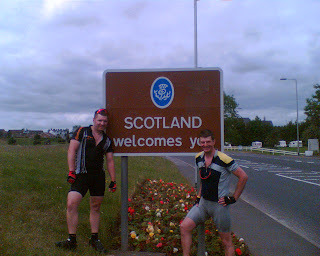 Land's End to John O'Groats Bike Ride: Day 6 - Welcome to Scotland.... please have a seat on my bonnet!! Day 6 - Welcome to Scotland.... please have a seat on my bonnet!! After a logistics nightmare, on Ian's part, which resulted in Rachel having to drive up to the next stop (Dumfries) to drop off all our stuff from Kendal and still be back for breakfast (THANK YOU), we were off again. A quick goodbye to families who had come up for the night and the three of us set off on the short warm up before we hit the climb over Shap fell. Not as bad as I expected, more of a long drag, then a steep climb, but the head wind was back just to make it a little more interesting! 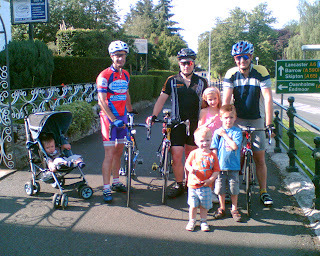 At Penrith, Kev left us to return home (by car) and Lee & Ian carried on through Carlisle and over the border into Scotland at Gretna. Again an incident free day until we hit Annan, where some idiot who couldn't see coming out of a petrol station decided to set off anyway. Lee had already passed, but fortunately Ian had seen what was coming and was hard on the brakes. When the car finally stopped he had slowed down sufficiently for Ian to just sit on the bonnet of the car (to protect the bike more than anything). To top it off the fool then tried reversing, but I was still clipped into my pedals and was about to be dumped on the floor, until I politely asked him to stop. I took myself to the side of the road (bike and body intact, if a little shaken) for the fool (with wife and family in car) to drive off. A big thank you to the young couple who first checked I was OK, before setting off after the fool and making him come back and check I was OK himself. Thanks again. The remainder of the trip into Dumfries was uneventful, until we hit the town and realised the map to find the B&B was in our bag, which was already at the B&B. Thanks again to Rachel for the direction and we found it with no further hassle. At the B&B we met up with Lee's dad who was providing the support on Monday.